DeLillo, D., Mao II (London: Penguin, 1992), 44. Mellencamp, P., High Anxiety: Catastrophe, Scandal, Age, and Comedy (Bloomington: Indiana University Press, 1992). Brooks, M., High Anxiety (94 min/colour, 1977). Johan Grimonprez refers to Robert J. Flaherty's 1922 film Nanook of the North (76 min/b&w). Borges, J.L., "The Book of Sand" in The Book of Sand and Shakespeare's Memory (Harmondsworth: Penguin Books, 2001). And tonight as a special attraction we shall present some television commercials. They will be injected at various points during our picture to keep you from getting to engrossed in the story. Mark Peranson: As a media artist who turns media into art, and makes art about media, your career is a double take—jumping from the cinema to the art gallery and back. Your films also inspire double takes in the viewer. dial H-I-S-T-O-R-Y (1997) shows how terrorists use the media, and vice versa, fostering a state of panic and paranoia within people; in Double Take (2009) the same psychological relationship is transferred, then doubled to the US and USSR during the Cold War, to Alfred Hitchcock and popular culture. Why Alfred Hitchcock? M.P. : In dial H-I-S-T-O-R-Y the feeling of the sublime is driven home through copious quoting of Don DeLillo: in Double Take, it's inscribed in Hitchcock's voice, via his lead-ins and promos, or via a voice double who speaks while a physical Hitchcock double appears on screen. J.G. : It's the Borgesian confrontation with the Other, but it doesn't comes without a warning: "If you meet your double, you should kill him." Maybe that is why the paranoid state of mind is in a way often the most grounded because it constantly questions and reevaluates given notions of "reality" and our political status quo. M.P. : As an artist with a keen grasp of the political and the social, you forego interpretation, dancing with density in a way that's far from stodgy: pleasure leaps out amid the seriousness, and, in a way, Hitchcock is reborn, freed from the academy's shackles. Double Take zips and zaps like the most addictive of television shows. M.P. : Is your art practice based in activism? J.G. : That would be a reductionist reading, but there's an activist component. I've been very unhappy with the state of the world, so, yes, let's change it! What's going on upsets me, so more than ever we should question what's going on in the media. The mainstream media don't correspond to the actual state of the world. And then the repressed comes back to haunt you in the form of Independence Day (1996), flying saucers into the World Trade Center. For me that was one interpretation of 9/11. Very often when we were analysing the early nineties with the collapse of the Soviet Union, that image of the alien kept coming back, and the imaginary Other of America was not filled in. Then 9/11 reshaped those boundaries. M.P. : So if there is this activism behind Double Take, the film can be read as you writing (or rewriting) history with the war on terror in mind, and using the beginning of the Cold War as a parallel cautionary tale. J.G. : Definitely it's a component of it. It's part of our world and it's so hard to deny that. When you put gasoline in your tank, it's part of your everyday reality. M.P. : Why not make a film about that, why bury it in something historical? J.G. : Well, apparently you got the message. M.P. : At the beginning of the film there is the image of the man falling from the Empire State Building, one might say that's a pretty clear allusion to 9/11. J.G. : At one point the film began with an anecdote that we found in an article from The New York Times from 11 September 1948: on that day, hundreds of birds crashed into the Empire State Building, landing onto Fifth Avenue. But I don't know why I took it out... The film is now showing in a gallery in New York, and when you walk in that quote is on the wall. M.P. : What is the difference for you between a feature film and an installation? Double Take also began as another installation, Looking for Alfred (2005), about the casting of the Hitchcock doubles. J.G. : I think what's more important is the general social context in which the work is read. For example during Tiananmen, the Chinese were watching CNN to compare it to Chinese television to look at the contradictions. But in the second Iraq War CNN was inscribed as a tool of war for Americans, something completely different. So the point of reception, the context in which something is shown, makes you read it in a different way, more so than the format. For dial H-I-S-T-O-R-Y the way it was shown in Israel was very different than in New York. M.P. : In Double Take you quote Hitchcock's winking critique of television—it's like a gun, your enjoyment depends on what side you're on. When television is analysed in an art (or filmic art) context, it usually comes with a wholesale critique. You imply that it's not the medium itself that is problematic, maybe because the new threat to traditional media arrived with the internet. J.G. : Mel Brooks told a funny story where he went out to dinner with Hitchcock, and Hitchcock ordered a steak—well, an appetizer, a steak and a dessert—and they finished, and then Hitchcock says, "Let's do it again", and ordered another full meal. M.P. : There's so much that you could mention about Hitchcock, he's almost an endless well, so to confine yourself from 1957 to 1963 must have been crucial. J.G. : Alfred Hitchcock Presents runs from 1955–62, The Alfred Hitchcock Hour starts in 1962. James Allardice was a writer for Alfred Hitchcock Presents, and he wrote all the lead-ins. He died in 1966, so maybe that's why the introductions stopped. He was also Hitchcock's speechwriter—his double in a way that he came up with the rhetoric, the jokes, and the idea of the doubling. The same with the MacGuffin story, it's actually a Scottish screenwriter, Angus MacPhail, who coined it. M.P. : And during that period is also the first time when Truffaut interviewed Hitchcock. J.G. : On the set of The Birds on 12 August 1962, which is also the date of my birth. M.P. : At times though you do fudge the historical record a bit... such as when you intercut the promo for The Birds with the news story on the launching of Sputnik. J.G. : Sure, but it's not that far off, because when you talk about 1957, it's also the time he started the TV series, and I lump The Birds in with that period, and his relationship to television. In 1959 he shot Psycho with his crew from Alfred Hitchcock Presents. Yes, it's not always accurate chronologically; the film jumps back and forth based on what's appropriate for any moment. He introduced The Birds by looking at the sky, so I cut to the paranoia that came with Sputnik; it made sense. In 1962 people were still freaked out... America wasn't far behind in the space race, but the paranoia was there. They drilled it into the television audience and the cinema newsreels. It was still the moment when television took shape, so that's also why I jump forth back in time. M.P. : But this also speaks to its unclassifiability; you can't simply call it a documentary, a fiction, or an essay film—it has all these things together. J.G. : In the way we actually construct our reality, or document that reality, there are always fictions that proliferate, there are always things that you project, and the way that we construct reality is based on fictions and paradigms that coexist—it's that way with Robert J. Flaherty. The wife of Nanook is his mistress, and the igloo is not a real igloo, they cut it in half.5 And, on the other hand, sometimes when you see a film that's fiction, it grabs you, because the violence is there, you get moved, closer to what the feeling really is. I like to put those things on their head, because they affect and inform one another. And CNN now dramatizes the news. The war is a complete fiction, but the news is supposed to be "documentary". It's so crucial to question those boundaries. For me the labels are secondary. dial H-I-S-T-O-R-Y was trying to explore the shift at the end of the '70s and beginning of the '80s when they got rid of the Bolex and took the video camera into the field, and bit by bit our relationship to video imagery shifted. M.P. : Do you think the media has become more a part of the power structure since the '60s? Or are people more desensitized to the imagery today? M.P. : And with television Hitchcock brought murder back into the American living room where it always belonged. J.G. : The film is sort of about that as well, but on a more personal level, like two guys talking about their characters, and how they kill them... maybe that's a poetic level, but it's weird to go from talking about the Iraq War to talking about poetry. But Truffaut wrote how Hitchcock portrayed his murder scenes like they were love scenes, and vice versa. It's like exploring what the boundaries of that narrative might be—you push the boundaries of what a love story might stand for. M.P. : It's also this mirror thing—if you have a double you can love it and hate it. J.G. : But television is a mirror as well. When images come back from Iraq, it's a mirror that we don't want to acknowledge. Then it comes back to haunt us on another level. It's a tough one, the power of the image... And Hitchcock was very much aware of that. M.P. : Does the fascination with Hitchcock come from the films themselves? The persona? A combination? J.G. : A combination, for sure. But, first of all, he went through everything, starting off in the silent period, the black and white period, crossed from Britain to the US, played on television, tried 3D, Panavision, etc. He went through the whole evolution of the medium: if one character would epitomize the history of cinema, it would be Hitchcock. He worked with all the clichés and metaphors... maybe also because he was such an influence on the Nouvelle Vague. And some of his best films have the typical symbols of the fairy tale, like Notorious (1946). But more than we realize now, he set forth a lot of our contemporary vocabulary. North by Northwest (1959) is a combination of spy thriller and comedy, which set forth the James Bond genre. M.P. : To talk about the editing for a second, you build complexity by repeating scenes in different contexts, such as the Folgers commercials. J.G. : Ah, again that's obsessive behaviour, like I was talking about with CNN. I thought it was fun to have five commercial breaks, with real commercials. At one point there's the ad where the coffee pot turns around, and at that point in the conversation the coffee becomes the poison—it's metaphorical as it's the advertising that's going to kill you. In the conversation they say television killed cinema. That's what Hitchcock would say, not me. But the obsessive behaviour of images being repeated is like the drop-in style, but when they're repeated they're set in a different context. You would be surprised at a lot of the things that I left out. For example, we have a Folgers commercial from the eighties with Rod Taylor, the star of The Birds. M.P. : How does Borges fit into the project? J.G. : Borges was a big part of Looking for Alfred. Which was about Magritte too, who is also a magical realist, or symbolist. I relate to Borges as a Belgian, as doubling in Belgian culture is very present: everything is subtitled. So "This is not a pipe" is a literally very Belgian thing, as when you see Star Trek or a Hollywood film on Saturday afternoon you have to read subtitles. So you're already removed. And there's no such thing as a Belgian language, there's either Flemish or French, so as a Belgian you always have to relate to something in a distanced way, with a kind of irony. J.G. : Well, first you have to define what you mean by postmodern, and as I still believe in a utopian project, which is very much in the film, I don't know if you'd call it postmodern... It's the same with The Birds, which lends itself to so many interpretations, because Hitchcock refused to put "The End" at the end, so it's openended. One analysis of The Birds is that they stand for television, Žižek says The Birds are libidinized by the repressed atmosphere of the relationship between the mother and the son, and so on. I think maybe I'm still a modernist—dial H-I-S-T-O-R-Y is very moral. CNN is postmodern. M.P. : I was talking more about structure. J.G. : I would call the Borgesian structure more magical realism. You know that Borges and Hitchcock were both born in August 1899, at the beginning, when the Lumière brothers were showing their films. Magritte was born in 1898, he's one year older than both of them. The shots in Double Take where Hitchcock is walking through the long corridors to go meet himself were shot in Brussels at the Palais des Beaux-Arts, where Magritte has a long history... Maybe that's where my background comes in. For Borges, the doubling also has to do with how language doubles reality. For Hitchcock it came to me first through the cameos, how he became a kind of double agent, and also plays on the doubles in the TV introductions. But the double is a very wellknown literary figure. Borges wrote the story that is the basis for the script of Double Take twice, once as The Other (1972) and later as August 25, 1983 (1983). Dostoyevsky, funnily enough, also rewrote The Double (1846) as it wasn't well received. M.P. : That also brings to mind Gus Van Sant's remake of Psycho (1998), or, of course, the fact that Hitchcock himself reshot Blackmail (1929) and remade The Man Who Knew Too Much (1934/1956). J.G. : Even on The Simpsons, you have it—Bart Simpson meets his double. Maybe it's been overused, but maybe it's also part of our consciousness. Maybe the nature of language, the idea of the double is built into the way we conceive and can talk about reality. I think the film has this philosophical application as well. It's also a doubling of what history is. We forget so easily that what was going on in the '60s is what's going on now, with nuclear proliferation and paranoia with Iran. Paranoia is turned into fear, and fear into a commodity. M.P. : And how popular culture can be an unconscious vehicle to transmit this paranoia... One thing that struck me is how Hitchcock's work, maybe unconsciously, stoked this Cold War paranoia, like The Birds, or, with Cuba, Topaz (1969). Or is it about how certain cultural objects take on the meaning of what's in the air, the social context of the time? J.G. : Or maybe it goes back and forth, yeah? Like Žižek would say, he libidinized the story, making a film about Cuba to be about sexual politics. That's how he makes you care about it. When I was editing I'd pick up on stuff and only later realize how present it is in the conversation today. It's invested with meaning, but maybe you pick it up in an unconscious way, and when it's out there you let the material take you. It's how novelists say the character takes over and dictates how the story is being told. With dial H-I-S-T-O-R-Y, I started off wanting to tell a story about saying goodbye, but the material took me in a different direction, to airplane hijacking and terrorism. This film was about the history of happy endings, and it became something completely different. Gaumont used to make films for France that had happy endings, and for the Russian audience they'd make a tragic ending. It's not explicit in Double Take, but from the beginning of the '60s—and I think it's related to television—a lot of directors in Hollywood started to take away "The End". The idea of what an "end" is had to be redefined with television. Like what Borges writes about the book of sand, you keep turning the pages and it keeps going, you can never finish it.6 Television is like that—it' s an image that doesn't end. And I watched as many Alfred Hitchcock Presents episodes that I could, then, bit by bit, you realize, oh, he has a lookalike contest, or he's walking off with his head, or playing his brother, or dresses up as a woman. Then you are confronted by Ron Burrage, the Hitchcock double. I was invited by the Hammer in Los Angeles, and they set me up in the UCLA archive. So I started researching that time period of The Birds, and stumbled onto Sputnik, and the first man in space is in 1961, right before The Birds. And the Bay of Pigs happens just after Gagarin got into space, on 12 April 1961. Also the Kitchen Debate, that I stumbled on in UCLA, that was the first summit on television. And how does it all relate? From the beginning of the '60s we started thinking about time in a very different way, we started thinking about "The End" in a very different way. Television is on when you have food, or you can go to the bathroom and come back, at that point you began to relate to the image in a very different way. M.P. : Double Take also seems to me to be a post-internet narrative, if you will. Look at how storytelling has changed since the internet, even Hollywood films have become much more complex, and it has to do with how people's minds have adapted in a way to this situation. J.G. : Exactly. Double Take takes into account the 'YouTube-ization' of the world. Even if it's not explicitly about that, it does analyse the intrinsic relationships between two or even three coexisting media, and the time slippages that occur between them. 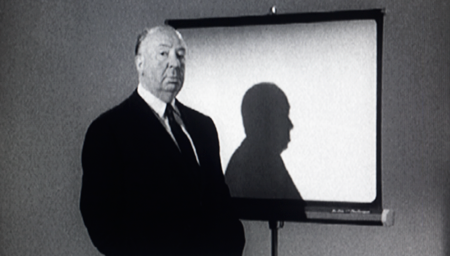 For example, the rupture instigated by the commercial break is as important as Hitchcock meeting his double from a different time period. Cinema is about an unfolding reel in time—at its most basal, it is a medium that makes use of time in an abstract way in order to construct a narrative. Storytelling will always be an interpretation of time. Adapted from: Peranson, M., "If You Meet Your Double, You Should Kill Him: Johan Grimonprez on Double Take", in Cinema Scope, no. 38 (Spring 2009), 14–18.